The Central African Republic marked a grim anniversary on Friday – it’s been one year since a coalition of mostly Muslim rebels seized power in the capital Bangui. In the year since, there has been a transfer of power twice as the country has fallen into ethnic cleansing, possible genocide, and lawlessness. A day ahead of the anniversary, a grenade attack during a funeral killed 11 people and injured 14. Red Cross officials who attempted to provide assistance and retrieve the bodies were themselves mugged by unidentified groups. The United Nations on Friday said that there are more than 650,000 who fled their homes in recent months, and over 290,000 having fled to neighbouring countries. In recent days, UN officials said the capital Bangui was nearly purged of Muslims as Christian militia roam the streets in a revenge spree. UN human rights chief Navi Pillay issued a warning last week that hatred between Christians and Muslims in CAR had reached a “terrifying level”. 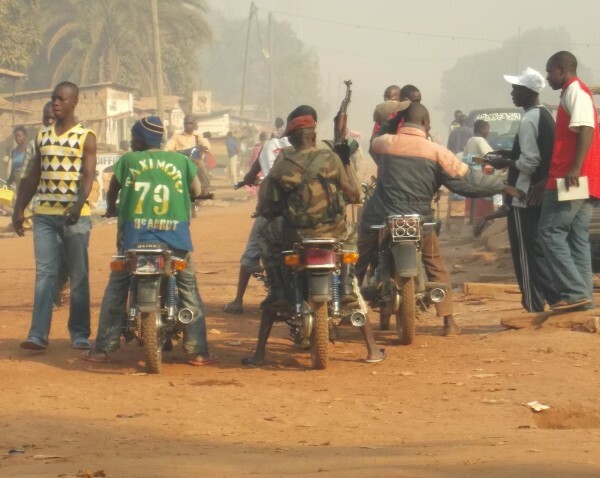 The current crisis in CAR – a mineral rich nation of 4.6 million people – began in December 2012 when Seleka – a rebel amalgamation of several different factions – began to move toward Bangui in hopes of removing Bozize, a military officer who seized power in 2003 and has been elected president twice since then. Analysts say that the rebel gains underscore the instability and extreme poverty that has plagued the country since independence from Paris in 1960 despite possessing vast agricultural, water and mineral resources, including uranium, gold and diamonds. The average monthly income is around $60. In January 2013, a ceasefire was reached and an UN-sponsored peace process led to the formation of a unity government in which the president was allowed to remain in office till 2016, provided top ministerial positions went to members of the Seleka Coalition. However, on March 23, 2013 the Coalition broke the national unity agreement and seized the capital Bangui. In the fighting, 13 South African peace-keeping soldiers were killed and 27 others wounded during a clash with the rebels. South Africa withdrew its forces. In December 2013, CAR President Michel Djotodia – a Muslim brought to power by the Seleka Coalition, called on the militia to exercise restraint and lay down their arms after nearly 1,000 people were reported killed in fighting with newly formed Christian militias. His attempts to calm the situation failed and in January 2014 he fled to nearby Benin. UN Secretary-General Ban Ki-Moon has repeatedly urged European powers provide peacekeepers to stabilize the situation. Some 1600 French troops were deployed to CAR last December, and in February Paris said dispatched 400 additional troops to help deal with the intensifying sectarian violence that has plagued the country for months, and reinforce the 6,000 African troops already there. The EU, meanwhile, had initially planned to send 800 to 1,000 soldiers but these efforts have been delayed for several weeks and in particular, amid the crisis in Ukraine. CAR officials have asked the UN Security Council to authorise a peacekeeping force of at least 12,000 to pacify the situation.